This website is a communication tool for intersection improvement and other transportation related projects in the City of Milton. The following projects are in various stages of concept development, design, right of way, and construction. With 6 operational roundabouts and more coming, please take a minute to review how to navigate a multi-lane roundabout in this WisDOT Roundabout Educational Video. Status (updated 2/5/19) Construction contract was approved with CMES, Inc. Road closure and detour planned for summer 2019. Status (updated 2/5/19) Phase 1 Heritage Walk Raised Crosswalks/Speed Tables to be installed during March 2019 weather permitting. Phase 2 Crabapple Road Streetscape plan to be submitted to GDOT for review spring 2019. Status (updated 10/9/18) Project is substantially complete with final punchlist remaining. See OVERALL PLAN WITH STRIPING for project overview. Status (updated 6/28/16) Concept study was approved by GDOT. Signal revision has been submitted to GDOT for approval to implement in 2019. Georgia Department of Transportation (GDOT) Programs – These updates are based on the latest information received from GDOT and are subject to change as GDOT is the project sponsor and determines the scope, schedule, and budget. Status (updated 10/18/18) GDOT has a program for operational improvements such as turn lane additions that can be implemented in a short period of time and for under $200k. There are 2 projects in the City of Milton that are being implemented through this program. Funding beyond the quick response improvements at these locations has not yet been identified but further improvements were recommended in the Milton Comprehensive Transportation Plan. The projects are:(1) S015040 Installing a 500 foot dedicated left turn lane on SR 372/Crabapple Road Northbound to Green Road; (2) S015041 Installing a left turn lane on SR 372/Birmingham Highway Northbound to Batesville Road. 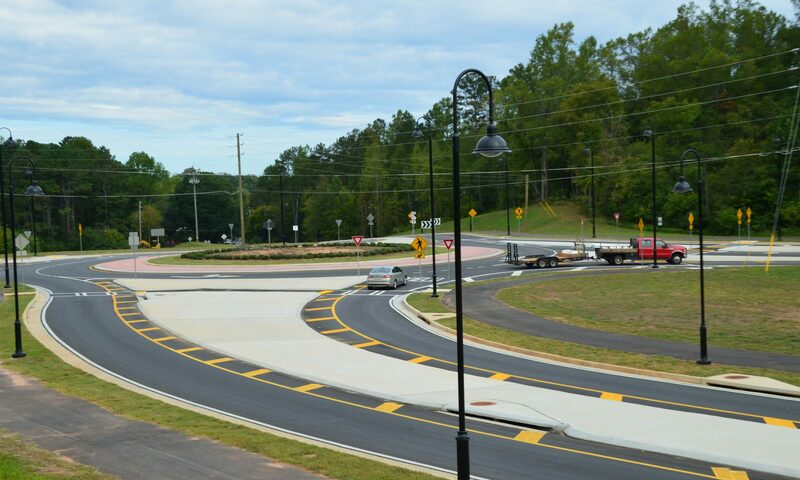 As GDOT was preparing to begin the Green Road project, the City of Milton was able to work out additional improvements as part of that project to create a Florida T type intersection and separate turn lanes on Green Road. With this intersection control, the left turn off Green Road only yields to Crabapple Road westbound thru and eastbound left turn. Also Green Road is proposed to have separate left and right turn lanes for 100 feet. GDOT has approved the design and the contractor is beginning work on the City’s Modified Design of S015040. Status (updated 11/15/18) The GDOT Operational Improvement Program provides “Quick Fix” projects to improve operations. Once an Operational Improvement Idea has been recognized, analyzed, and considered to be a viable improvement, it passes through the Operational Improvement Committee for approval. At the October 2018 Operational Improvement Committee meeting, intersection improvements at SR 372/Birmingham Highway at Hickory Flat Road/Birmingham Road was approved by GDOT to move forward as a project with funding. The concept presented was a mini roundabout (approximately 85′ diameter with mountable center island and outside truck aprons around the corners. The next steps for GDOT are to create a project number and transition the project to the GDOT Office of Program Delivery to set the schedule and begin the project. The funding for design is in FY 19 (7/1/18-6/30/19) and it is likely the construction funding will be in FY 21 (7/1/20-6/30/21) but that is subject to change once more details are gathered. The City is working with GDOT to stay involved and updated on the progress and project development.